A new window opens. Select "UCI" as type. Click on the "..." button in the Engine path row, search the folder you copied the engine to and select the engine you want to install (e.g. Rybka 3 w32.exe). Press "Open". Now you can press OK. In this list, you can also select the hash size for the engine (fifth column). Rybka uses the hash to remember the positions it has searched, so a bigger hash table will slightly increase the engine strength. A good hash table size is usually your computer's RAM divided by 4. Note that Rybka can only use powers of 2 as hash size, ie. 1, 2, 4, 8, 16, 32, 64, 128, 256, 512, 1024 or 2048 MB. 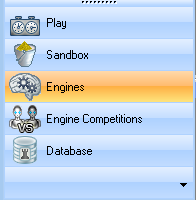 Go to sandbox or database mode and press the little arrow at the bottom of the "Analyze" button. 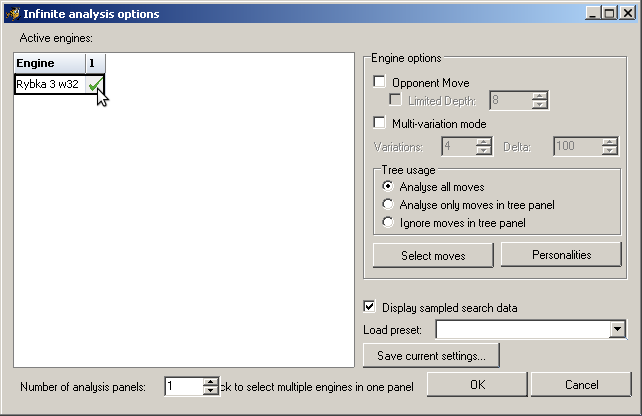 Check the square next to the engine name as shown in the picture and press OK.
Now you can start analysing by pressing the "Analyze" button. That's all. Enjoy your analysis with Rybka! If you have further questions, you may want to read the Aquarium FAQ or visit our forum.